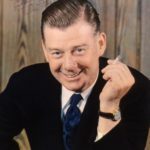 Arthur Godfrey was an American radio and television broadcaster and entertainer who was sometimes introduced by his nickname, The Old Redhead. An on-air incident undermined his folksy image and resulted in a gradual decline. At the peak of his success in the mid-1950’s, Godfrey helmed two CBS-TV weekly series and a daily 90-minute television mid-morning show, but, by the early 1960’s, his presence had been reduced to hosting the occasional TV special and his daily network radio show, which ended in 1972. "I’m proud to pay taxes in the United States; the only thing is, I could be just as proud for half the money." "I liked the way they treated the first, second, and third place finishers equally. It was an amazing year. I only entered two song contests this year; I won one and placed second in the other. And I entered each of them a day or two before the deadline." "Married and divorced, three beautiful daughters, two in college. The other one is 16, lives with her mom. I’m 46, I’ve worked for the Post Office for 18 years, seven facilities in three states."